Calling all Kroger and affiliate shoppers! 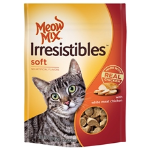 Hurry over here for this week’s Kroger FREE Friday download of FREE Meow Mix Irresistibles Cat Treats. This eCoupon is available for download today only, October 9th but you have until October 11th to redeem it. I love Kroger freebie Friday!